Masudaya 16-inch! Lost in Space! 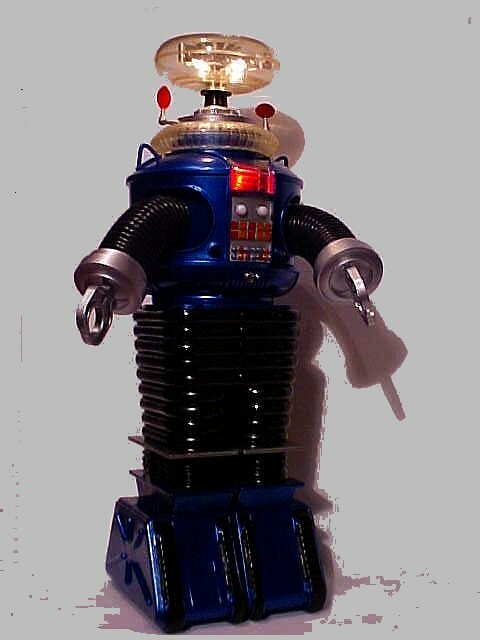 Pro-Built B-9 Robot! Warning! Warning! ~ For Fun! Retro-Style! fashioned after the Remco sixties-colors for a very retro feeling done with this 16-inch Masudaya-Robot that was a model kit no longer manufacured in Japan in the 80's. This Robot has just been beautifully painted professionally. Ready to add to any Lost in Space Sci-Fi collection. 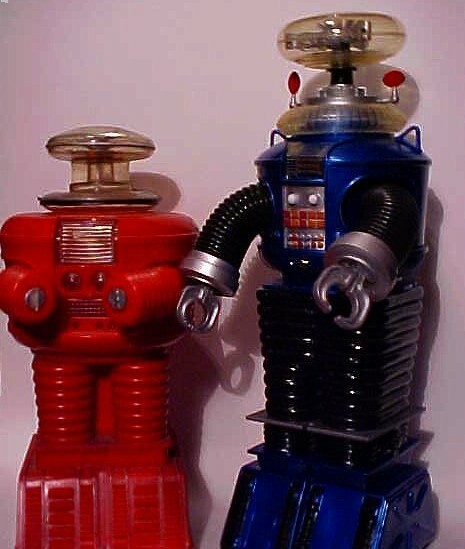 Red-Remco Robot shown pictured for comparsion not included! ..... 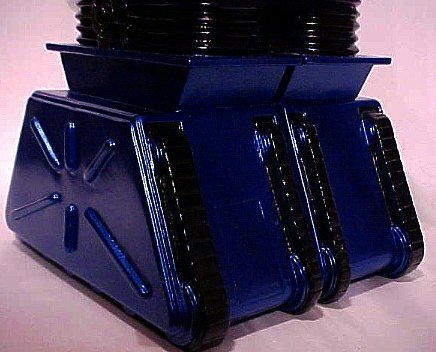 High-Gloss Metallic-Retro-Blue with Black-Rubber Look-Legs & black-treads. Took many hours to paint the round-wheels in the metallic-blue on robots platform where black-treads run across platform front, under-side & back. 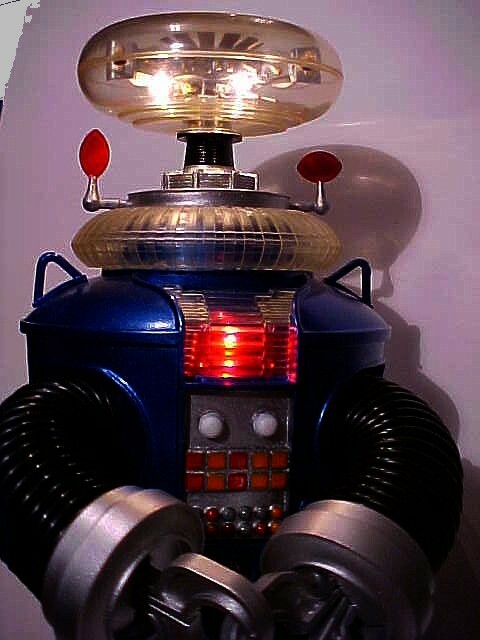 ....... With blinking light-up lights in chest bright-red & two white-lights blink in bubble-head. 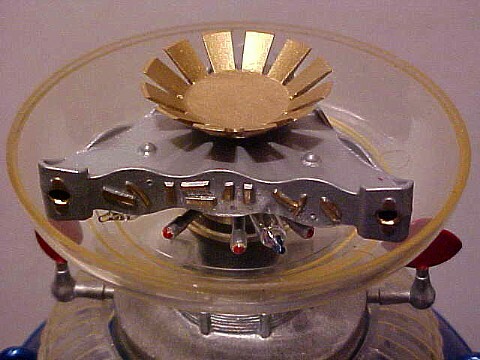 Bubble-head brain-triangle with scratch-built cut-out details painted gold-metallic over siver-metallic, silver-spokes below the brain-triangle with red-tips. 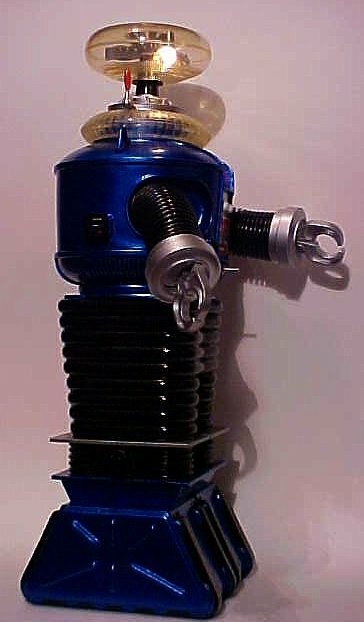 Also very neat custom scratch-built power-pac located on side of robot-barrel. Extra-extra-plus improved robot-arms they have been replaced with all new black-coil-arms with inside wire & foam that bends a more realistic postion for look of arms as to the vinyl-arms that come w/Masudaya-kit! Claws & Cuffs painted metallic silver. One light switch on-off works lights located below robot control-plate front center. Sensors both red! ......... Newly provided eight AA-batteries in power-unit which cradles in robot barrel as all batteries changeable. Sorry but the badly done robot voice has been taken out in place for the battery-pac for lights. Another fantastic creation by Robot-Artist, Jerry VonMueller of New York City.